Here is the small crochet bag I made for an online exchange. It works well to protect small items you want to carry around, or hide the box of condoms feminine hygiene products in your handbag. Or one of those purse-packs of tissues. This one is made to fit a Tarot deck, but it would be easy to make in any size you wanted. I call this delightful colour Mould With Gold, but I think the person it’s going to will like it, and that’s what counts. It’s growing on me (as mould does), I like the finished bag much more than I liked the ball of cotton. I’ve found that it’s best not to get too decorative if you want a sturdy bag. I kept the bag itself simple for that reason, and added some pattern to the flap. This flap is not terribly complicated either. For full-yet-amateurish instructions, jump to the full post. In a nutshell, ch means chain, which is simply pulling a loop of thread through the loop on your hook. Repeating this forms, uh, a chain. 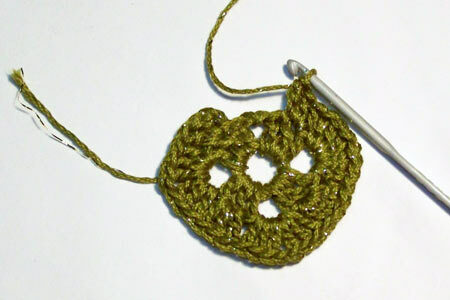 sc = single crochet – there’s a loop on your hook, you pull a second loop through the the stitch in the row below, and then you snag a loop of free thread and pull it through those two loops. This pattern begins at the flap, then works a long strip like a scarf. The side panels are added last, then the resulting t-shape is stitched together to form the bag. 4 ply crochet cotton (50g ball from Clever Country by Beutron). I don’t know what the equivalent thread is in American terms, but if it helps the label says it is suitable for bedspreads, fashion garments, tablecloths and doilies. I refuse to consider how many balls and how many hours would go into a crochet bedspread. Row 1: ch2, dc2 into the formed loop. ch2 dc3, ch2 dc3, ch2 dc3, ch2, join to top of the ch2 at the start of this round, turn. Row 2: ch2, dc2 into the centre stitch of the ‘shell’ (3 stitch group) in the row below. 3dc, ch1, 3dc into the gap created by the two chain stitches. [dc3 into the centre stitch of the next shell, dc3 ch2 dc3 into the next gap]. Repeat  twice more to reach the starting point, join, turn. Row 3: ch2, dc2 into space between shells. dc3, ch1, dc3 into corner gap. [dc3 into next gap, dc3 into next gap, dc3 ch1 dc3 into corner gap]. Repeat  on next two sides. dc3 into remaining gap, join and turn. Row 4: as before, dc3 into each gap, with dc3 ch1 dc3 to form each corner. If you are making a smaller bag you may omit this row – the flap should be roughly the width of the item you intend to store in the bag. If you are making a larger bag, repeat this row to achieve the size you want. Now you find yourself in the middle of one side of the square that is the flap. You might like to cut your thread here and join on again at the side, but I hate joining so I simply slip-stitched along the side to a corner so I could start the next row from there. So, starting from the corner! Row 5: ch4, slip stitch into second stitch along. Continue to cover three sides of the square. 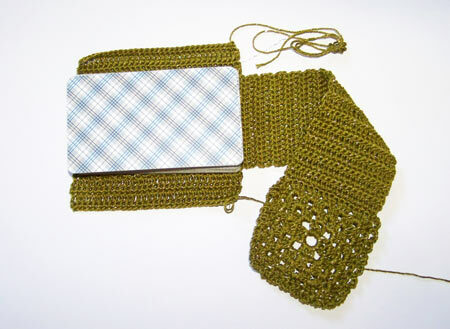 This creates a lacey outer row of bumps of chain over one-stitch gaps. I thought it needed this bit of decoration but you might prefer to omit it. Row B: ch1, sc in each stitch to end. Turn. Repeat AB until desired length is reached, ending with a B (sc) row. As my deck of cards was 12cm long and 2.5 cm deep, I needed 2.5 cm to cover the top, 12cm down the back, 2.5cm across the bottom, and 12cm up the front. (The flap overlaps the front of the bag, it doesn’t replace any of it). So in total I needed 29cm. For the non-metric, that’s a 4.75″ x 1″ deck, so needs 11.5″ to wrap around it. 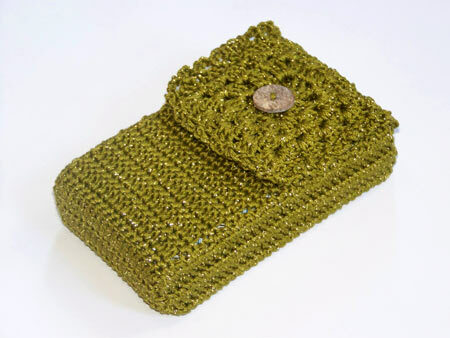 Remember that crochet work is stretchy, and you may want to make it slightly smaller than your item if you want it to fit snugly. Turn your strip so you can stitch down the side of it. Now for the annoying task of creating a stitching row from the sides of stitches. ch1, then sc along the side for, in my case, 12cm. I got 31 closely spaced stitches. When inserting your hook, try to poke into tight spots and try not to use just one thread to stitch under. Single threads pull more easily and leave you with what looks like uneven holes in the base of your row. As with the rest of the body, you will now repeat AB to the depth required. 2 pairs gave me just under an inch so I chose to rely on a little stretch making up the difference, rather than adding another pair. Now, sadly, it’s impractical to slip stitch to the next starting point so you have to end off here. I snipped the thread a good foot away from the work, as this tail of thread can be used when it comes time to stitch the bag together. Join thread to the other side of the central strip and sc a matching length for that side. One side is more difficult than the other, because on one side you were sc-ing into chain stitches at the start of every dc row, whereas on the other side you have the dc at the end of the dc row to deal with. Add the AB rows to match the opposite side panel. Now, simply take an embroidery needle and weave in any loose ends you aren’t planning to use to stitch the bag together. Then use either the threads you left attached to the work, or fresh thread, to assemble the bag. I used the attached bits at the end of each side panel, because I’m lazy efficient. Aim to have the corners of each side line up with the same row of work along the body. When adding the button, it helps if your embroidery needle is thin enough to fit through the holes in the button. Really. It helps a lot. I also pulled the gold filament out of the thread I used for stitching on the button, because when using a short length of thread it tends to unravel and get in the way.It’s also a good idea to put the intended contents in the bag so you can close the flap and see exactly where you want the button to go. I attached the thread, then stitched through the button a couple of times, then attached the thread again. But you could also leave a tail of loose thread, stitch through the button a couple of times, then tie the starting and ending loose ends together. That’s the end of my plan. If I have made any glaring errors, please let me know!